Author Jon Sykes has been climbing in the White Mountains of New Hampshire for what seems like forever. Frankly I'm not sure if anyone has put up more first ascents on the north side of the notches than he has. Jon's first guidebook was Secrets Of The Notch, published in 2001. It included both rock and ice routes in and around Franconia Notch and was very popular. 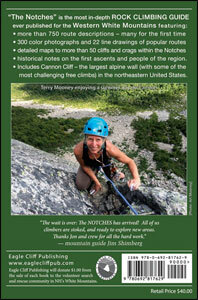 This book focuses entirely on rock routes and is much more ambitious, encompassing Crawford Notch. Zealand Valley, Franconia Notch, Cannon Cliff and Kinsman Notch. While some of the areas covered in this book, such as Cannon Mountain, have been covered in other books, several have not. Development in Kinsman Notch and Mt Oscar are all fairly recent and are only available on Internet sites like NEClimbs or MountainProject so it's very nice to have them in book form. Secrets of the Notch was a small, paperback sized book, however The Notches is a much larger tome, similar to Jerry Handren's North Conway Rock Climbs book. It is chock full of great color pictures, route drawings, topo maps, a bit of history and even some stories. Check out "Cannon's Big Three" by Andy Tuthill! The descriptions are generally complete and many of the climbs are rated with stars. There is an overall alphabetical index in the back of the book and each of the areas have their own rating index. The areas have a color coding along the edge of the book, making it easy to pick up the book and go right to a particular area. Conclusion: I have climbed lots of the routes covered in The Notches, but by no means all. I've never climbed at Kinsman Notch, but reading the descriptions has me all excited about a new place to play. If you're climbing or planning to climb in these areas, this book is a must-have. Huge kudos to Jon Sykes and his associates for the work they have done and for this valuable addition to the climbing community.